“Peace is always beautiful” – Walt Whitman Humans really know how to commemorate their fallen and the incredible monuments dedicated to war stand as evidence. Seeing those, a few will probably say that death is beautiful but this article will continue the series and will focus on peace. From the most prolific countries in the world, unique, memorable and with a lot of history behind, these are the twelve picks that will help you decide if humans are as good at honoring peace, as they did with wars. Japanese city of Hiroshima is the first in the world to suffer a nuclear attack. On August 6, 1945, on a Monday morning, the United States of America at the order of Harry Truman dropped the “Little Boy” that virtually wiped out the whole city and caused more than 140,000 civilian deaths. 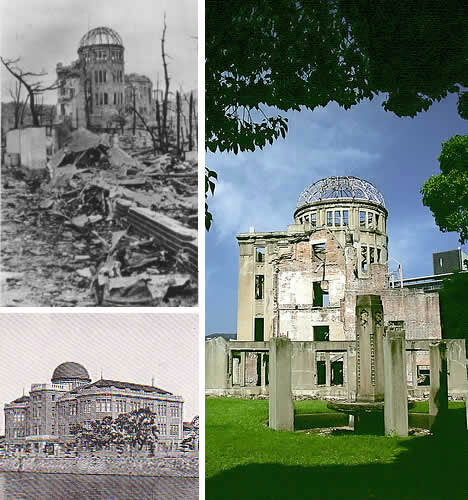 The Hiroshima Peace Memorial, also known as the Atomic Bomb Dome (Gembaku Dome in Japanese) is part of the Hiroshima Peace Memorial Park and was the closest structure, 490 feet away, to withstand the explosion. It is now a reminder for the first nuclear attack in the world and a true symbol for the preservation of world peace and the elimination of all nuclear weapons. The Peace Monument in Washington D.C. is a stunning piece of architecture built between 1877 and 1878. 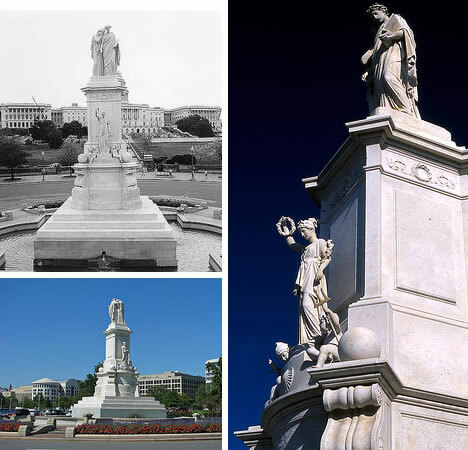 It stands on the grounds of the United States Capitol in the Piece Circle, is also known as the Naval Monument and was actually built to commemorate the naval death during the American Civil War. One of the most expressive sculptures is “Peace”. It’s a classical figure draped from the waist down that holds an olive branch and faces the Capitol. This was the final part to be put in place (January 1878) that completed the whole monument. 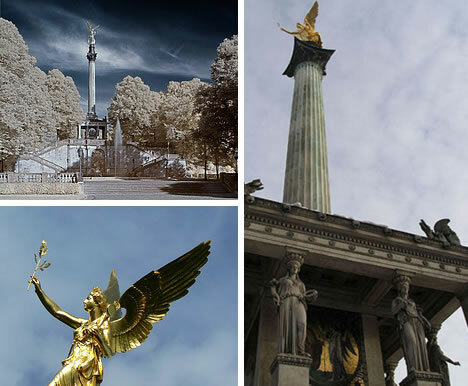 Friedensengel is a Peace Angel on a Corinthian column in the midst of the Prince Regent Street, in Munich. The gilded figure is an allegory portraying Athena, the goddess of wisdom and peace, which holds Nike in her hand, the goddess of victory and was built in 1896-99 to celebrate the 25th anniversary of the Treaty of Versailles (1871) that ended the Franco-German war of 1870-71. The 125-feet high Angel of Peace monument also offers a spectacular view of the city. Mohyla Â­ru or the Cairn of Peace is a memorial near the Prace village in the Czech Republic. The 85-feet high monument built by Joseph Fanta in 1910 – 1912 commemorates the battle of Austerlitz also known as the Battle of the Three Emperors ( December 2nd, 1805) when Napoleon defeated the Austrian and Russian troops coalition, that later led to the Peace Treaty of Pressburg (Bratislava of our days). 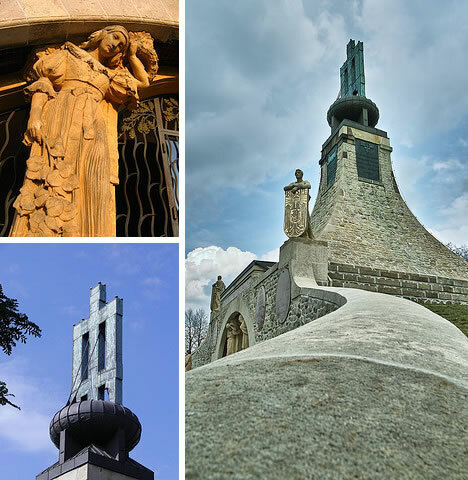 Within the memorial there is a chapel a small museum, while on the outside, four female statues symbolizing France, Austria, Russia and Moravia are guarding the whole memorial. The Shrine Peace Monument located in Exhibition Place on Toronto’s lakeshore, faces southerly toward the United States and the Niagara River (part of the border between Ontario and the New York state) for a reason. Dedicated to more than a century of peaceful relations between Canada and the United States, the bronze monument was offered by the Ancient Arabic Order of Nobles of the Mystic, in June 1930. 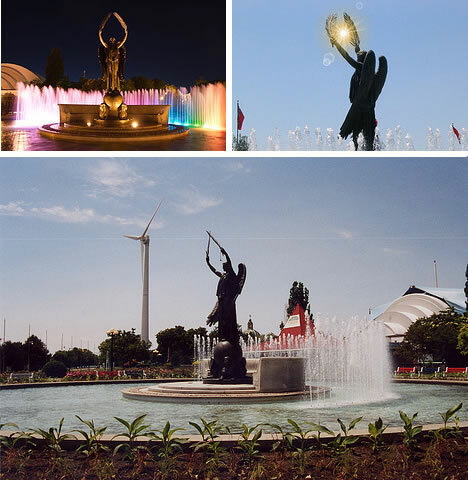 28 years later a fountain and gardens were added and the statue was beautiful than ever, enforcing the cause of peace. 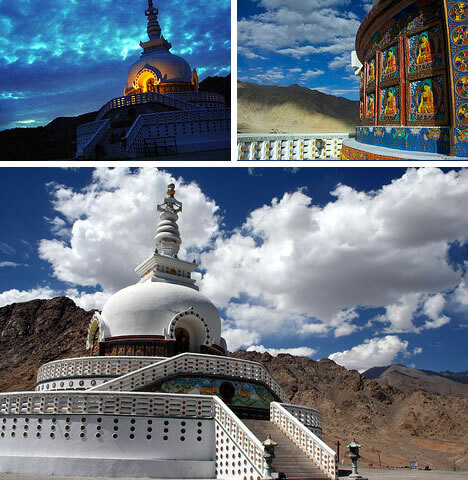 The work of a Japanese Buddhist organization called the “The Japanese for World Peace”, Shanti Stupa is a peace pagoda built in 1980 on top of a hill in Leh city, India, at 12,000 feet above the sea level. Celebrating 2,500 years of Buddhism and promoting World Peace, the magnificent white-domed monument is decorated with colorful paintings and large statues of Buddha. Another reason why tourists visit the Shanti Stupa is the breathtaking panoramic view of the chain of mountains and the small and peaceful village of Changspa, especially at sunset. Some say the World Peace Bell in Newport, Kentucky, is the largest free swinging bell in the world, from a total of over 20 bells dedicated to peace. 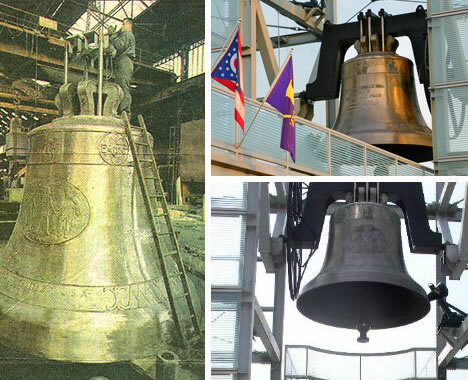 Weighing over 60,000 pounds and being 12 feet wide, it was installed in 1999 as a symbol of peace and freedom by the Verdin Company, world’s largest supplier of bells, carillons, and clocks. They first swung the bell (12 times) on January 1st, 2000 at midnight and people 25 miles away were able to hear it. The Millennium bell is made 80-percent of copper and 20-percent of tin, and swings daily in Newport at noon. Inspired by the Wailing Wall of Jerusalem, the Wall for Peace in Paris is the work of artist Clara Halter and architect Jean-Michel Wilmotte on the Champs de Mars, at the foot of the Eiffel Tower. 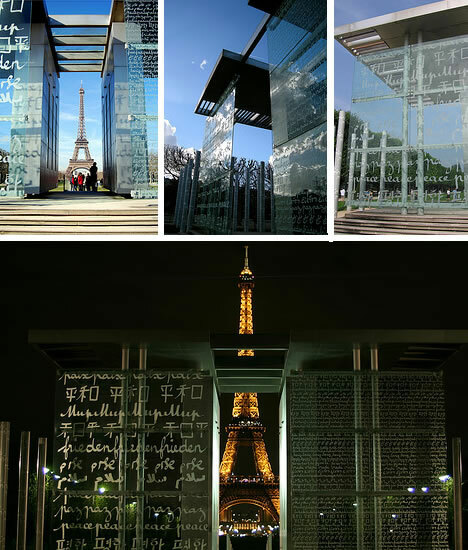 Inaugurated in March 30, 2000, the glass and metal monument that the French call Le mur de la paix, has “peace” written in 32 languages and 18 alphabets, and allows visitors to put their messages in the chinks of the wall. Viewing the Eiffel Tower through the glass is a thrillingly beautiful experience. 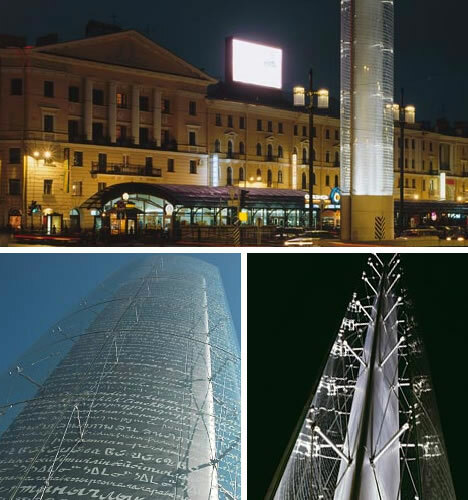 The same people, Clara Halter and Jean-Michel Wilmotte installed three years later, a tall slender shape to blend in with the buildings in the Sennaya Square in Saint Petersburg. They called it the Peace Tower of Saint Petersburg. The pedestal design was determined by the route followed by the traffic into the square and has the signatures of important politicians, economists, intellectuals or artists that visited it and understood what the tower stands for. 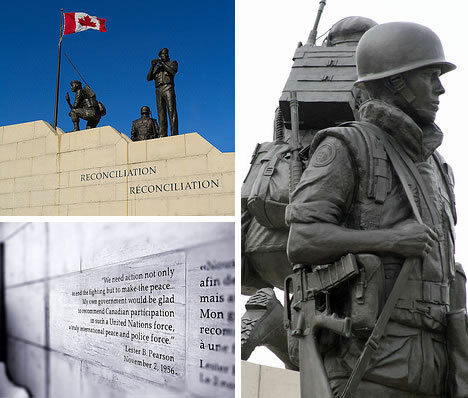 Two men and a woman, standing proud on two ridges of stone, are the peacekeeping soldiers from the Reconciliation Memorial in Ottawa, Canada, the only one of its kind in the world. 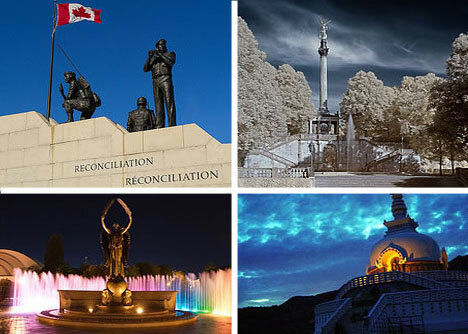 Also known as the Peacekeeping Monument it celebrates Canada’s involvement in keeping the world peace, honoring the country’s soldiers that have served in the United Nations Peacekeeping Forces. On the base of the monument, Canadian politician Lester Peasrson is quoted (from 1956) : “We need action not only to end the fighting but to make the peace… My own government would be glad to recommend Canadian participation in such a United Nations force, a truly international peace and police force“. 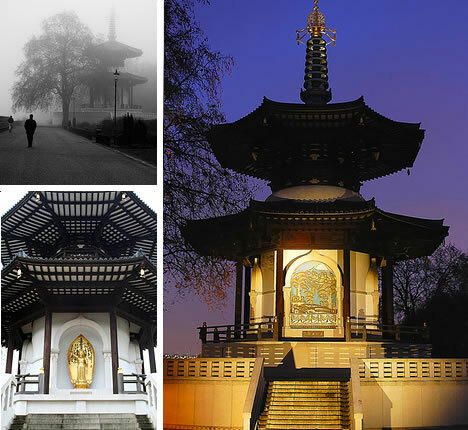 There aren’t many peace pagodas built in Europe, but this one in Battersea Park in London is special and has a lot of history behind. It was built in 1985 with permission from The Greater London Council, alongside the Thames. For casual visitors it may be incongruous to find a Buddhist construction in a fundamentally Christian city, but it’s for a noble cause. The London Peace Pagoda was a gift to the city from the Buddhist Order, as a means of celebrating peace around the world. 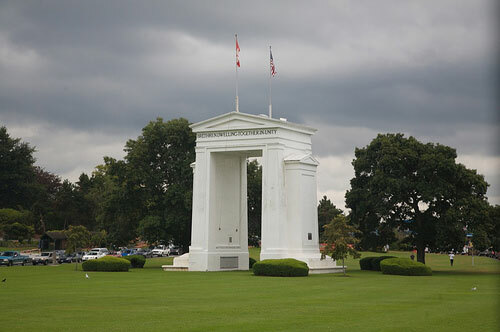 Now that you know about the Shrine Peace Monument in Toronto, another monument that celebrate peace between the US and Canada, the Peace Arch, was built south of Vancouver with one “foot” in each country. The 67 feet tall monument by Sam Hill was built in 1921 to celebrate the signing of the Treaty of Ghent in 1814, that ended the 1812 war between the United States of America, Great Britain and Ireland. The monuments has the two flags of each country and is known as the Peace Arch Border Crossing. On the Canadian side it has the words “Brethren dwelling together in unity” while on the US side it says “Children of a common mother”.